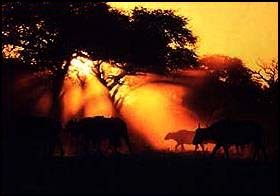 n the days when everybody started fair, Best Beloved, the Leopard lived in a place called the High Veldt. 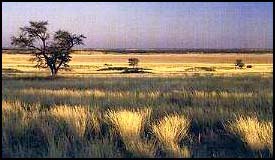 'Member it wasn't the Low Veldt, or the Bush Veldt, or the Sour Veldt, but the 'sclusively bare, hot shiny High Veldt, where there was sand and sandy-coloured rock and 'sclusively tufts of sandy-yellowish grass. The Giraffe and the Zebra and the Eland and the Koodoo and the Hartebeest lived there: and they were 'sclusively sandy-yellow-brownish all over; but the Leopard, he was the 'sclusivest sandiest-yellowest-brownest of them all -- a greyish-yellowish catty-shaped kind of beast, and he matched the 'sclusively yellowish-greyish-brownish colour of the High Veldt to one hair. This was very bad for the Giraffe and the Zebra and the rest of them: for he would lie down by a 'sclusively yellowish-greyish-brownish stone or clump of grass, and when the Giraffe or the Zebra or the Eland or the Koodoo or the Bush-Buck or the Bonte-Buck came by he would surprise them out of their jumpsome lives. He would indeed! And, also, there was an Ethiopian with bows and arrows (a 'sclusively greyish-brownish-yellowish man he was then), who lived on the High Veldt with the Leopard: and the two used to hunt together -- the Ethiopian with his bows and arrows, and the Leopard 'sclusively with his teeth and claws -- till the Giraffe and the Eland and the Koodoo and the Quagga and all the rest of them didn't know which way to jump, Best Beloved. They didn't indeed! After a long time -- things lived for ever so long in those days -- they learned to avoid anything that looked like a Leopard or an Ethiopian: and bit by bit -- the Giraffe began it, because his legs were the longest -- they went away from the High Veldt. They scuttled for days and days till they came to a great forest, 'sclusively full of trees and bushes and stripy, speckly, patchy-blatchy shadows, and there they hid: and after another long time, what with standing half in the shade and half out of it, and what with the slippery-slidy shadows of the trees falling on them, the Giraffe grew blotchy, and the Zebra grew stripy, and the Eland and the Koodoo grew darker, with little wavy grey lines on their backs like bark on a tree-trunk: and so, though you could hear them and smell them, you could very seldom see them, and then only when you knew precisely where to look. They had a beautiful time in the 'sclusively speckly-spickly shadows of the forest, while the Leopard and the Ethiopian ran about over the 'sclusively greyish-yellowish-reddish High Veldt outside, wondering where all their breakfasts and their dinners and their teas had gone. At last they were so hungry that they ate rats and beetles and rock-rabbits, the Leopard and the Ethiopian, and then they had the Big Tummy-ache, both together: and then they met Baviaan -- the dog-headed, barking baboon, who is Quite the Wisest Animal in All South Africa. 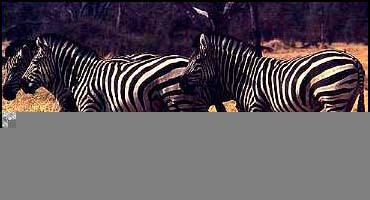 They let the Zebra and the Giraffe get up; and Zebra moved away to some little thorn-bushes where the sunlight fell all stripy, and the Giraffe moved off to some tallish trees where the shadows fell all blotchy. So he changed his skin then and there, and the Leopard was more excited than ever: he had never seen a man change his skin before. 'But what about me?' she said, when the Ethiopian had worked his last little finger into his fine new black skin. Then the Ethiopian put his five fingers close together (there was plenty of black left on his new skin still) and pressed them all over the Leopard, and wherever the five fingers touched they left five little black marks, all close together. You can see them on any Leopard's skin you like, Best Beloved. 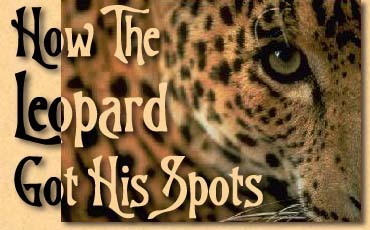 Sometimes the fingers slipped and the marks got a little blurred; but if you look closely at any Leopard now you will see that there are always five spots -- off five black finger-tips. So they went away and lived happily ever afterwards, Best Beloved. That is all. 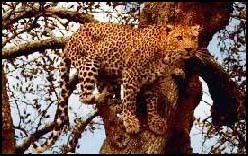 Oh, now and then you will hear grown-ups say, 'Can the Ethiopian change his skin or the Leopard his spots?' I don't think even grown-ups would keep on saying such a silly thing if the Leopard and the Ethiopian hadn't done it once -- do you? But they will never do it again, Best Beloved. They are quite contented as they are. 10043 people have changed their spots since July 18, 1996.